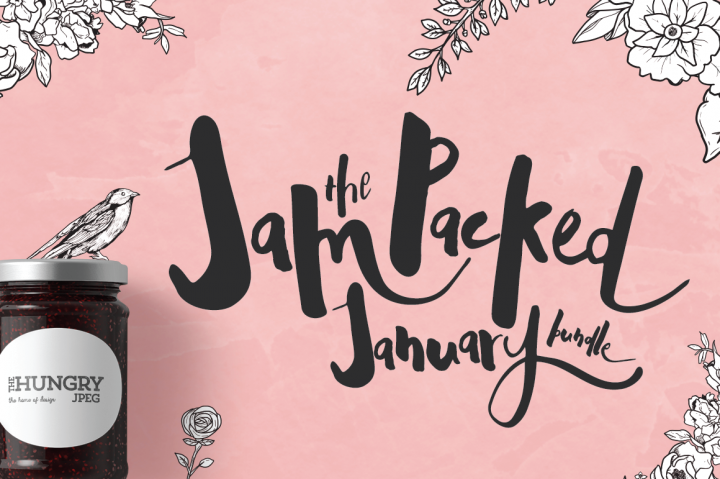 The Hungry JPEG is currently offering “The Jam Packed” January bundle to make it easier to enjoy graphic design. Perhaps one of the best deals ever offered, there are a lot of items included within this bundle. Graphic designers and do-it-yourselfers are going to enjoy 36 premium fonts along with 15 graphic packs. The deal is only available for the month of January, so once it’s gone, it’s gone for good. Gorgeous fonts are available so that no one is forced to use the standard fonts that come with the various programs in use, such as Microsoft Word and Photoshop. The fonts can be used to design flyers, signage, book covers, labels, and much more. In addition to the fonts, there some graphic packs to make it easier to create attractive and eye catching signage, logos, and more. Many different industries can benefit from the graphics that are included in the Jam Packed bundle for January. There are hand drawn cameras, feathers, flowers, arrows, and even a pack known as “Arctic Space.” The graphic bundles come with many different PNS, EPS, and JPG formats, ranging from backgrounds to patterns to textures to postcards. A commercial license is included with all of these as well, and unlimited free support for anyone who has questions. Anyone who designs a lot of signage, covers, cards, or anything else can benefit from the package. Buying it as a bundle saves a lot of money, which is all the more reason to take advantage of the January bundle from The Hungry JPEG before it’s going, going, gone for good. Why not check out the hundreds of other fonts sold on TheHungryJPEG.com by clicking here.